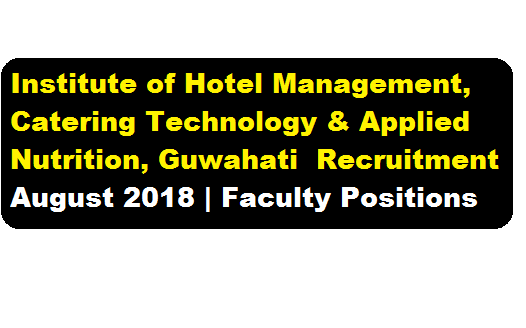 Institute of Hotel Management, Catering Technology & Applied Nutrition, Guwahati Recruitment 2018 :- The Institute of Hotel Management, Catering Technology and Applied Nutrition, Guwahati is sponsored by the Ministry of Tourism, Government of India. The Institute invites application for Part-time faculty Visiting faculty (4 Nos.) on per hour pay basis in a recent recruitment published on August 2018 Below we have mentioned full details of the recruitment. 1) Full time Bachelor’s Degree in Hospitality & Hotel Administration / Hotel Management after 10+2 from a Recognized University and Master’s degree in Hospitality & Hotel Administration / Hotel Management. Full time Bachelor’s Degree in Hospitality & Hotel Administration / Hotel Management after 10+2 from a Recognized University with at least 2 years industry experience Desirable: NHTET conducted by NCHMCT, Noida. 2) Age limit : Not exceeding 35 years, (as on 1/8/ 2018). The candidate who fulfills the above criteria may submit their application to the undersigned on or before 5th September 2018 along with their contact number, e-mail Id etc.